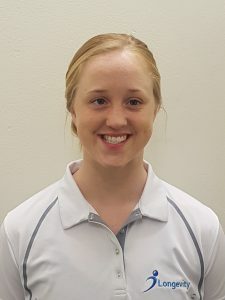 Exercise Physiologist Courtney Maher has joined Longevity Personal Training and Exercise Physiology during a time of business growth. Her motivation, dedication and commitment to Longevity has been second to none. Courtney developed a passion for movement from a young age, training and competing in dance and rhythmic gymnastics from age 7. In 2010 and 2011, she was a member of the NSW State Rhythmic Gymnastics Representative Team. She achieved high results and went on to compete in the Australian Gymnastics Championships. Since 2014, Courtney has trained at the University of New South Wales dance society and competes at the Australian All Star Cheer-leading Federation (AASCF) National Cheer and Dance Championships. As an athlete, she learnt the importance of persistence and looking beyond the physical components in order to reach one’s goals. Courtney’s appreciation for the positive impact exercise has on physical, mental and social health led her to complete a Bachelor of Exercise Physiology at the University of New South Wales. Here she learnt about the increasing number of Australians living with chronic disease and knew that she could help people to use exercise as a key part in successfully managing their condition long term. Courtney also coaches at the Aussie Bodz Performing Arts, teaching her skills to children aged 5-13 years. Courtney’s commitment to her own and others training, has given her an in-depth understanding of different exercise methods and modalities. She emphasises the importance of stretching to all her clients, as she believes this will help them stay mobile and minimise the risk of injury. Courtney has worked with clients of all ages and with varying health conditions. She has developed a special interest working with clients living with Osteoporosis, Parkinson’s disease, chronic pain and mental health conditions. Courtney values the importance of understanding a person’s full history in order to deliver specific exercise tailored to their needs. As an Accredited Exercise Physiologist and Personal Trainer, Courtney’s drive is to use the best available evidence for exercise and lifestyle prescription, to help others live their healthiest life.